Marketers are evidently enthusiastic heading into 2014….about everything. A fascinating new study was released this morning from Salesforce ExactTarget Marketing Cloud (a client of Convince & Convert). 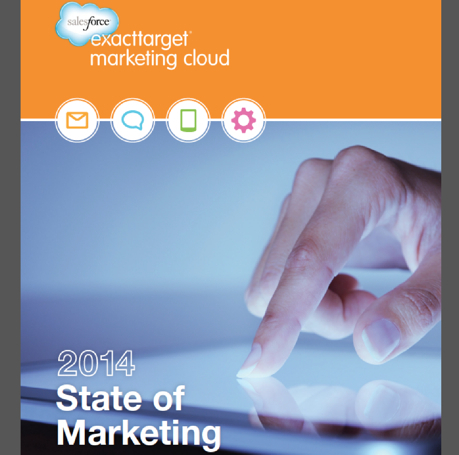 Called 2014 State of Marketing, insights from over 2,500 global marketers, the report is full of data about marketers’ outlook and plans for the coming year. Several interesting point in this study, including the fact that increasing brand awareness is the number two priority among respondents (which are incidentally a very broad pool of marketers – from entry level and small business, to 35+ years of experience and global enterprise companies). Also intriguing is the finding that 34% of participants say that social media is producing ROI today, with another 52% believing that it will produce ROI eventually. The most extraordinary statistic in this report is that marketers appear to be almost universally bullish on digital marketing, and are planning to throw gobs of cash at every conceivable digital tactic. The 2014 State of Marketing found that 58% of marketers plan to increase spending on email marketing; 53% plan to increase on SMS; 54% plan to increase on search; 57% plan to increase on social media; 60% plan to increase on marketing automation; 43% plan to increase on display/banner ads; 49% plan to increase on mobile push notifications; and 55% plan to increase on social advertising. I wasn’t a math major, but if everything is going up, what is going down? Other than the 6% of responding marketers that predict they’ll spend less on banners in 2014, where are all these dollars coming from? The oft-reported prediction from Gartner that the CMO will control more technology budget than the CIO by 2017 may in fact turn out to be true, but that’s still three year off – allegedly. Sure, maybe some of these budget increases will be paid for by reducing expenditures on TV, radio, outdoor, print, event sponsorships, snacks, logo golf balls, or from some other magic pot of gold. I believe something else is afoot here. I believe that marketing has grown in complexity and opportunity at an unprecedented rate for five years, to the point that many marketers do not really know what works, or what may work in the future. We have more marketing capability and capacity than ever, but paradoxically less certainty than ever. It’s like an expensive game of musical chairs, with each seat comprised of a different type of digital marketing savior. It’s no wonder then that the number one category of increase in marketing budgets in 2014 is “Data and Analytics” with 61% of responding marketers planning to boost budgets there. How can you decide to increase your marketing budget for all or nearly all digital tactics WITHOUT knowing which of them are actually paying off for your company? You can’t. Or at least, you shouldn’t try. This age of marketing complexity benefits three groups, specifically. More consolidation is on the way, powering #3, above. #2 is on me, and my ilk. But #1 is your responsibility. Make this year the year that you get great at data, so that you can make the best possible decisions about where and how to spend your marketing resources, okay? Because you can’t wallpaper over scarce insights by increasing budgets everywhere…at least not forever. Grab a copy of this very interesting report for yourself (it’s free).